IT'S a curious thing, but a cemetery can often tell us as much about a town as its living residents. On moss-covered headstones the spare, telling details of lives speak of long-gone days. It was at the graveyard just outside of Cooktown, more than a chat over a schooner in a local pokie bar, that I learned most about this pleasant, sleepy town five hours' drive north of Cairns. The pioneers who built the town may have rubbed shoulders in their lives, but it is clear from the cemetery that when they died they went their separate ways. At the entrance are the Irish Catholics, over there other Christians and down a trail at the back is a shrine to the Chinese from Guangdong province who came with the gold rush. It is estimated about 18,000 Chinese, mostly males, arrived in Cooktown in the four years to 1877. They outnumbered the entire European population of northern Australia. Today, Cooktown's population is a paltry 2000 but the wide streets, good hotels and picturesque harbour await a tourism boom yet to happen. That's the appeal of this place. You feel you have it to yourself. You walk slower, rise later and slip into the more leisurely pace of the locals. I certainly did. History is what makes this town where, a century and a half ago, there were 50 hotels. Today, there are three, among them the West Coast Hotel, sitting here seemingly lost on the east coast of Australia. Back in 1949, a cyclone destroyed much of the original Sovereign Hotel. It became "the Half Sovereign" and now stands opposite the historic Post Office, not a stone's throw from the statue of Captain James Cook, who pulled his ship Endeavour ashore here for seven weeks in 1770 after it hit a coastal reef. In the former St Mary's Convent, an impressive 1880s building, is the James Cook Historic Museum which tells Cook's story and that of the local Guugu Yimithirr people. Here are one of Endeavour's enormous anchors, painted Aboriginal spears and shields, household items from the colonial period alongside adzes and a collection of terrifying medical equipment from a century ago that must have kept doctor's visits to a minimum. Beyond the museum is the famed Nature's Powerhouse, the 62ha botanic garden that draws tourists for its diverse specimens, cafe and gallery of delicate botanic illustrations of the extraordinarily gifted Vera Scarth-Johnson. Cooktown seems pleasantly relaxed today, but it suffered considerably in its short life. After the gold rush the population drifted away, there were devastating fires and cyclones, and during World War II most people were evacuated. Many Aborigines died when moved from their lands. At the cemetery, a sad tale is told on a headstone. She was white and living with the local Aboriginals as one of their own. She spoke no English, no one knew her origins and she simply became known as The Normanby Woman. She was taken from her people, brought back to "civilisation" (the headstone has inverted commas) but could not adapt and died a year later in 1886. Such stories, and those of discovery, conflict and tragic lives played out, are common here. 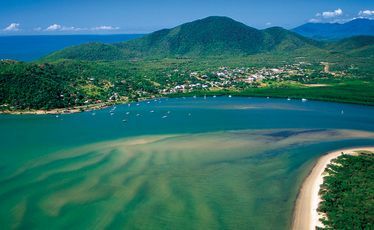 Yet today, Cooktown offers an escape from haste, serious fishing and decent restaurants. It is also the gateway to the ruggedly beautiful Far North. Oh, and you can also take a photo of a low ridge no bigger than an ignorable Auckland volcano. Why would you want to? It is, of course, Mt Cook.